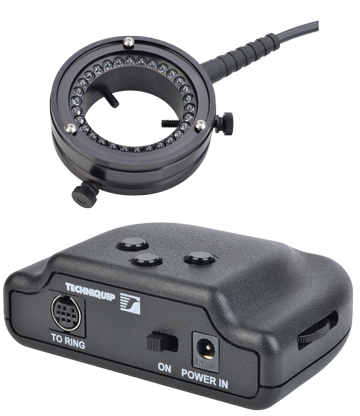 The ProLine 30 LED ring lights (aka: LED-30) are the latest generation of light sources from Techniquip. The compact design is compatible with most microscope objective lenses and can be useful in providing a pseudo-darkfield illumination. The integrated heat sink design combined with proprietary constant current controller technology permits higher outputs while still maintaining a very long LED life. The controller allows for any of the 3 segments (10 LED’s each) to be turned on/off individually for added flexiblity of lighting. The ProLine 30 LED ring light systems are provided with a universal power source for worldwide operation and can be powered by battery (contact us for information). These ‘Made in USA’ LED ring light systems provide the highest quality of manufacture and performance at a reasonable cost. We can supply the ProLine 30 ring light in alternate spectrum LED’s (e.g. Red, IR, UV, warm white) or in a wide angle model with very quick delivery and no minimum quantity. Contact us with your specific requirements.